Voutchkova, Thieke and Tammen have developed a strong interest in exploring granulated particles that increase the sensitivity of perception for themselves and their audiences. Biliana and Michael have worked together intensively within (and in between) both compositional and improvisational methods since 2011 presenting their work in various festivals/concert series in Europe (Austria, Germany, Italy, the Czech Republic, Serbia and Bulgaria). They released their first album “Already there” on the Swiss label Flexion records. The music of the duo focuses on the detail in music, micro tonality, imagery and intensely dynamic, but often slowly moving soundscapes – chiseled beauty and expressive communication fully formed. Their continued ongoing investigation of these processes has led them to their current project, “Blurred Music”. 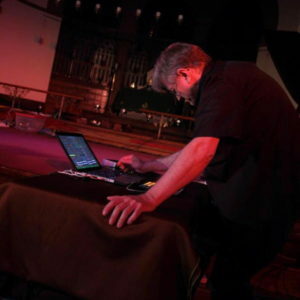 In this concert at Harvestworks they meet with Hans Tammen, who will fragment, distend and otherwise transform their sounds, creating a strange world of bizarre textures, with layers of intensity at times unsettling and anti-sentimental. His music is “transforming a sequence of instrumental gestures into a wide territory of semi-hostile discontinuity; percussive, droning, intricately colorful, or simply blowing your socks off” (Touching Extremes). Through deconstruction of (traditionally conceived) instrumental tone, the trio focuses on granulated particles of sound that becomes the material of a whole new world of music, created on the same old instruments. Much of trio’s interest in micro-elements manifests itself into forms of chiseled and austere beauty. But an increased expressivity has entered experimental music through the immediacy, intimacy and interactivity of improvisation. Voutchkova, Thieke and Tammen have developed a strong interest in exploring granulated particles that increase the sensitivity of perception for themselves and their audiences. They deliver the findings of these explorations with intensity and feeling. Voutchkova/Thieke duo tour in the USA is supported by the Trust for Mutual Understanding and the Goethe Institut Chicago. Voutchkova/Thieke photo by Lora Vasileva.